We often think the process of hearing God’s voice is more complex than it really is. We may be straining to hear God speak in one specific way, when in fact, He is communicating in creative and unique ways which we must learn to discern. As you discover the different ways God speaks, you can position yourself to hear His voice with fresh, supernatural clarity! In this revelatory new book, prophet Doug Addison teaches all believers to recognize and decipher the different languages of God. Understand the supernatural languages of the Holy Spirit, including prophecy, dreams, visions, and angelic encounters. 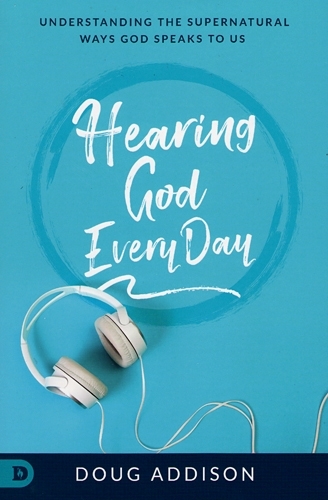 Access the benefits of hearing God’s voice. Create an “open-heaven” lifestyle where hearing from God is normal. Recognize three levels of hearing and responding to the Spirit. Understand the timing and seasons of God for what He is saying. When we hear God’s voice and respond to what He says, we will step into new dimensions of anointing, blessing, and destiny! Features activation prayers to begin hearing and encountering God. I love tools for my relationship with God, and Doug Addison delivers an amazing one in his new book. Doug has a unique connection to language and expression that will take you on a journey into understanding the supernatural ways that God speaks to you! When you learn how to hear from God you learn how to thrive in life, and Doug is giving you bite-sized ingestible pieces to do just that. Read this book! Doug skillfully takes the reader through the different and various ways God speaks to us so that w can recognize, respond to, and perceive God’s still, small, and audible voice. Hearing God brings wisdom, increased prosperity, and healing to us as we develop a lifestyle of communing with God through prophecy, dreams and visionary encounters with the myriad angelic messengers sent by God. Learning how to maintain an open heaven empowers us to see and speak to God whenever we need to hear from Him. I am proud to call Doug my friend and I highly recommend him as a prophetic mentor and life coach to everyone who wants to grow in their spiritual understanding of God’s supernatural ways. Doug Addison is a prophetic speaker, author and coach. He is known for his Daily Prophetic Words, Spirit Connection webcast, podcast, and blog. He and his wife, Linda, live in Los Angeles, California, where they are impacting the arts, entertainment, and media industries.